Its having mostly villager ability to chop wood,mine gold/stone,fish,forage,farm,hunt animals,hunt bird,build,repair,or trade... except shepherd or laying site. Its attack capability of being held in existing state.instruments of the working tools,bow,hoe,axe,pick,or wand. Any of short,long,far,anear working tools that counter damage bonus as of cavalry,building,infantry,sail,machinery different arms. The militia were at drill in the town center 2#key. 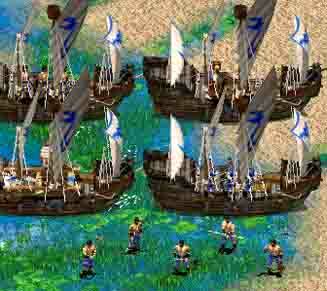 Its having mostly sail ability to fishing,trade cog,scorpion,fire ship,mangonel,or archers. Any of mode can be called only for an object. Along with changes unit and that changes line of sight,movement speed,attack range,or attack data in the same time. The Warship were at drill in the Port. How did you do the mangonel-ship? The ship annex with mangonel image. Hello, Lonewolf. Don't worry, it's fairly easy. If you open the DATA folder inside your Age of Empires game folder, you will find two files: empires2_x1 and empires2_x1_p1. First make sure you back them up by saving them in a separate folder, then overwrite them with the ones in this download. When you want the game back in its original form, just put the original two files back in the same way.